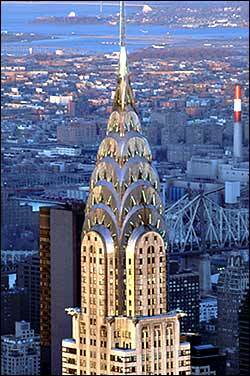 The Chrysler Building is a hallmark of the Manhattan skyline. Positioned at 42nd Street and Lexington Avenue, the building towers over nearby Grand Central Station, total height of 1048 feet. Appointed with huge gargoyles, the artwork and architecture are the epitome of the Art Deco movement. "The design, originally drawn up for building contractor William H. Reynolds, was finally sold to Walter P. Chrysler, who wanted a provocative building which would not merely scrape the sky but positively pierce it." William Van Alen (1883 – 1954), an American architect, was the principal designer. ↑ Peter Gossel and Gabriele Leuthauser. Architecture in the Twentieth Century. p209. This page was last modified on 20 February 2011, at 18:52.